Huge GEORGE STRAIT News.! If you're a Country fan, you will LOVE this! The King of Country Music George Strait has announced Honky Tonk Time Machine. Coming out , on Friday, March 29th The Great George Strait is ready with 12 new songs and his version of the Johnny Paycheck classic “Old Violin,” Honky Tonk Time Machine is GEORGE STRAIT's 30th career studio album. 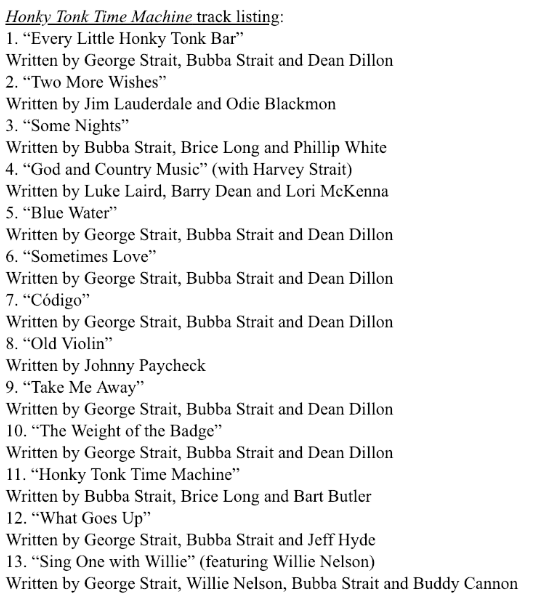 You'll note that Strait, who produced the record, wrote eight of the 13 tracks !!! It's going to be so good to hear knew Country music from this legend. I had a feeling he couldn't stay retired for too long! Track 13 is an instant classic that George and Willie performed on stage at Bridgestone Arena Jan 12 in their very first performance together EVER!. Watch em in action below.